This manual explains how to use the Extended Data Exchange (XDE). It provides basic documentation on setting up and using XDE. For advanced information on XDE and its applications, see our E-learning & Training offerings. The Extended Data Exchange (XDE) module allows extending the scope of exchange by translating additional data attached to geometric BREP data, thereby improving the interoperability with external software. Data types such as colors, layers, assembly descriptions and validation properties (i.e. center of gravity, etc.) are supported. These data are stored together with shapes in an XCAF document. It is also possible to add a new types of data taking the existing tools as prototypes. Finally, the XDE provides reader and writer tools for reading and writing the data supported by XCAF to and from IGES and STEP files. The XDE component requires Shape Healing toolkit for operation. Shape – a standalone shape, which does not belong to the assembly structure. Instance – a replication of another shape with a location that can be the same location or a different one. Assembly – a construction that is either a root or a sub-assembly. The basis of XDE, called XCAF, is a framework based on OCAF (Open CASCADE Technology Application Framework) and is intended to be used with assemblies and with various kinds of attached data (attributes). Attributes can be Individual attributes for a shape, specifying some characteristics of a shape, or they can be Grouping attributes, specifying that a shape belongs to a given group whose definition is specified apart from the shapes. XDE works in an OCAF document with a specific organization defined in a dedicated XCAF module. This organization is used by various functions of XDE to exchange standardized data other than shapes and geometry. 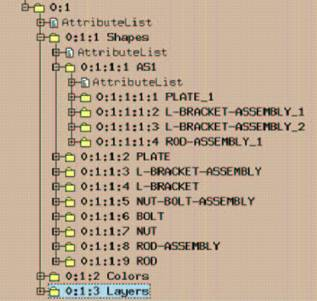 The Assembly Structure and attributes assigned to shapes are stored in the OCAF tree. 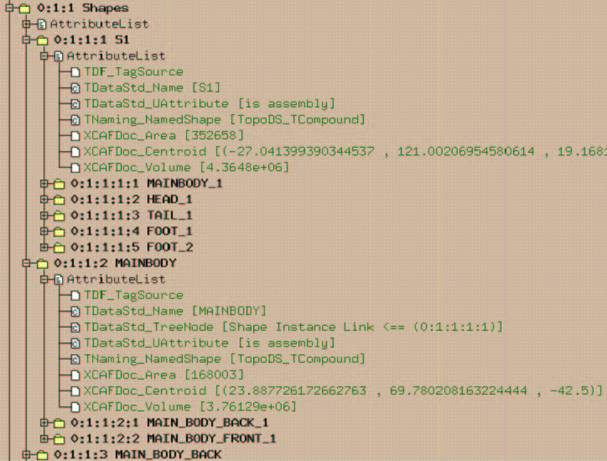 It is possible to obtain TopoDS representation for each level of the assembly in the form of TopoDS_Compound or TopoDS_Shape using the API. Basic elements used by XDE are introduced in the XCAF sub-module by the package XCAFDoc. These elements consist in descriptions of commonly used data structures (apart from the shapes themselves) in normalized data exchanges. They are not attached to specific applications and do not bring specific semantics, but are structured according to the use and needs of data exchanges. The Document used by XDE usually starts as a TDocStd_Document. 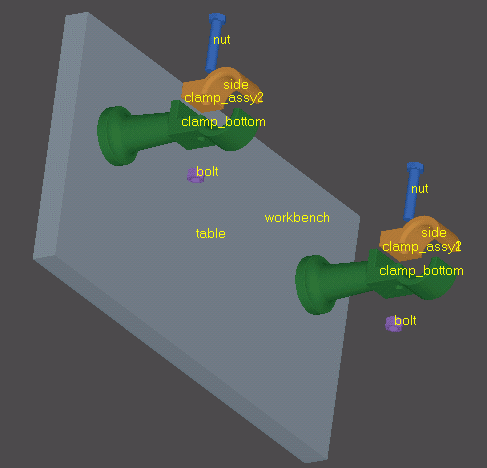 XDE supports assemblies by separating shape definitions and their locations. Shapes are simple OCAF objects without a location definition. An assembly consists of several components. Each of these components references one and the same specified shape with different locations. 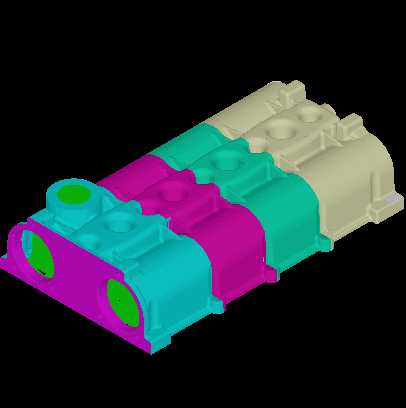 All this provides an increased flexibility in working on multi-level assemblies. XDE defines the specific organization of the assembly content. Shapes are stored on sub-labels of label 0:1:1. There can be one or more roots (called free shapes) whether they are true trees or simple shapes. A shape can be considered to be an Assembly (such as AS1 under 0:1:1:1 in Figure1) if it is defined with Components (sub-shapes, located or not). XCAFDoc_ShapeTool is a tool that allows managing the Shape section of the XCAF document. This tool is implemented as an attribute and located at the root label of the shape section. Validation properties are geometric characteristics of Shapes (volume, centroid, surface area) written to STEP files by the sending system. These characteristics are read by the receiving system to validate the quality of the translation. This is done by comparing the values computed by the original system with the same values computed by the receiving system on the resulting model. Advanced Data Exchange supports both reading and writing of validation properties, and provides a tool to check them. 0:1:1:1 312.6 (0%) -181.7 (0%) 0.00 0.00 0.00 "S1"
0:1:1:2 -4.6 (0%) -191.2 (0%) -0.00 0.00 -0.00 "MAINBODY"
0:1:1:3 -2.3 (0%) -52.5 (0%) -0.00 0.00 0.00 "MAIN_BODY_BACK"
0:1:1:4 -2.3 (0%) -51.6 (0%) 0.00 0.00 -0.00 "MAIN_BODY_FRONT"
0:1:1:5 2.0 (0%) 10.0 (0%) -0.00 0.00 -0.00 "HEAD"
0:1:1:6 0.4 (0%) 0.0 (0%) 0.00 -0.00 -0.00 "HEAD_FRONT"
0:1:1:7 0.4 (0%) 0.0 (0%) 0.00 -0.00 -0.00 "HEAD_BACK"
0:1:1:8 -320.6 (0%) 10.9 (0%) -0.00 0.00 0.00 "TAIL"
0:1:1:9 0.0 (0%) 0.0 (0%) -0.00 -0.00 0.00 "TAIL_MIDDLE"
0:1:1:10 -186.2 (0%) 4.8 (0%) -0.00 0.00 -0.00 "TAIL_TURBINE"
0:1:1:11 0.3 (0%) -0.0 (0%) -0.00 -0.00 0.00 "FOOT"
0:1:1:12 0.0 (0%) -0.0 (0%) 0.00 -0.00 -0.00 "FOOT_FRONT"
0:1:1:13 0.0 (0%) 0.0 (0%) -0.00 0.00 0.00 "FOOT_BACK"
In our example, it can be seen that no errors were detected for either area, volume or positioning data. XDE supports reading and writing the names of shapes to and from IGES and STEP file formats. This functionality can be switched off if you do not need this type of data, thereby reducing the size of the document. datums, i.e theoretically exact geometric references, such as point, line or plane, to which toleranced features are related. tessellated presentation, i.e. data is displayed in a human-readable way. XDE supports reading from STEP and storing named planes used for clipping. Currently, XDE supports saving of clipping planes in XBF format only. XDE provides capabilities for adding, editing and removing clipping planes. XDE supports reading from STEP views. Views allow saving information about camera parameters (position, direction, zoom factor, etc.) and visible shapes, PMIs, used clipping planes and notes. Currently, XDE supports saving of clipping planes in XBF format only. set visible shapes, PMIs, used clipping planes and notes. Custom notes is a kind of application-specific data attached to assembly items, their attributes and sub-shapes. Basically, there are simple textual comments, binary data and other application-specific data. Each note is provided with a timestamp and the user who created it. Gets / deletes orphan notes. The Document used by XDE usually starts as a TDocStd_Document. CSF_PluginDefaults points to sources of %CASROOT%/src/XCAFResources ($CASROOT/src/XCAFResources). CSF_XCAFDefaults points to sources of %CASROOT%/src/XCAFResources ($CASROOT/src/XCAFResources). Before working with shapes, properties, and other types of information, the global organization of an XDE Document can be queried or completed to determine if an existing Document is actually structured for use with XDE. If the Document is suitable for XDE, you can perform operations and queries explained in this guide. However, if a Document is not fully structured for XDE, it must be initialized. Note that the method XCAFDoc_DocumentTool::ShapeTool returns the XCAFDoc_ShapeTool. The first time this method is used, it creates the XCAFDoc_ShapeTool. In our example, a handle is used for the TDocStd_Document. In the previous example, you can also get the Main Item of an XDE document, which records the root shape representation (as a Compound if it is an Assembly) by using ShapeTool(Doc->Main()) instead of ShapeTool(aLabel). You can then query or edit this Assembly node, the Main Item or another one (myAssembly in our examples). Note that for the examples in the rest of this guide, myAssembly is always presumed to be accessed this way, so this information will not be repeated. This call performs a top-down update of the Assembly compounds stored in the document. Note that you have to run this method manually to actualize your Assemblies after any low-level modifications on shapes. Note that several top-level shapes can be added to the same component. If the Shape is a compound, according to the user choice, it may or may not be interpreted as representing an Assembly. If it is an Assembly, each of its sub-shapes defines a sub-label. If the Shape is not a compound, it is taken as a whole, without breaking it down. Each node of the assembly therefore refers to its sub-shapes. Concerning located instances of sub-shapes, the corresponding shapes, (without location) appear at distinct sub-labels. They are referred to by a shape instance, which associates a location. Note that if the label corresponds to an assembly, the result is a compound. If findInstance is True, a search is made for the shape with the same location. If it is False (default value), a search is made among original, non-located shapes. The count of users is contained with nbusers. It contains 0 if there are no users. If subchilds is True, commands also consider sub-levels. By default, only level one is checked. Note isref returns False if aLabel is not for a reference. In addition to the previously described AddShape and SetShape, several shape edits are possible. This operation will fail if the shape is neither free nor top level. If expand is True and aShape is a Compound, aShape is broken down to produce sub-components, one for each of its sub-shapes. If the sub-shape is found (yes), subLabel is filled by the correct value. Note that there should be only one shape for a valid model. In any case, the search stops on the first one found. By attaching an item from the table. Adding the color directly. When the color is added directly, a search is performed in the table of contents to determine if it contains the requested color. Once this search and initialize operation is done, the first way of attaching a color to a shape is used. In IGES, every entity can have a name with an optional numeric part called a Subscript Label. For example, MYCURVE is a name, and MYCURVE(60) is a name with a Subscript Label. 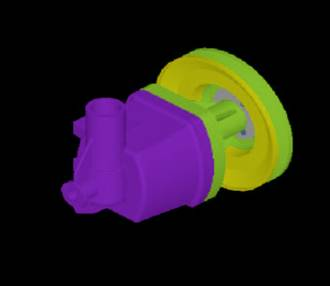 Part Names are attached to ;main shapes; such as parts and assemblies. These Part Names are specifically supported by XDE. Entity Names can be attached to every Geometric Entity. This option is rarely used, as it tends to overload the exploitation of the data structure. Only some specific cases justify using this option: for example, when the sending system can really ensure the stability of an entity name after each STEP writing. If such stability is ensured, you can use this option to send an Identifier for external applications using a database. Note that both IGES or STEP files handle names as pure ASCII strings. These considerations are not specific to XDE. What is specific to data exchange is the way names are attached to entities. Don't forget to consider Extended String as ASCII, for the exchange file. A Centroid is defined by a Point to fix its position. It is handled as a property, item of the class XCAFDoc_Centroid, sub-class of TDF_Attribute. However, global methods give access to the position itself. This notion has been introduced in STEP, together with that of Volume, and Area, as defining the Validation Properties: this feature allows exchanging the geometries and some basic attached values, in order to perform a synthetic checking on how they are maintained after reading and converting the exchange file. This exchange depends on reliable exchanges of Geometry and Topology. Otherwise, these values can be considered irrelevant. A centroid can be determined at any level of an assembly, thereby allowing a check of both individual simple shapes and their combinations including locations. An Area is defined by a Real, it corresponds to the computed Area of a Shape, provided that it contains surfaces. It is handled as a property, item of the class XCAFDoc_Area, sub-class of TDF_Attribute. This notion has been introduced in STEP but it is usually disregarded for a Solid, as Volume is used instead. In addition, it is attached to simple shapes, not to assemblies. A Volume is defined by a Real and corresponds to the computed volume of a Shape, provided that it contains solids. It is handled as a property, an item of the class XCAFDoc_Volume, sub-class of TDF_Attribute. This notion has been introduced in STEP. It may be attached to simple shapes or their assemblies for computing cumulated volumes and centers of gravity. XDE can read and write colors and layers assigned to shapes or their subparts (down to level of faces and edges) to and from both IGES and STEP formats. In an XDE document, colors are managed by the class XCAFDoc_ColorTool. It works basing on the same principles as ShapeTool works with Shapes. This tool can be provided on the Main Label or on any sub-label. The Property itself is defined as an XCAFDoc_Color, sub-class of TDF_Attribute. Colors are stored in a child of the starting document label: it is the second level (0.1.2), while Shapes are at the first level. Each color then corresponds to a dedicated label, the property itself is a Quantity_Color, which has a name and value for Red, Green, Blue. A Color may be attached to Surfaces (flat colors) or to Curves (wireframe colors), or to both. A Color may be attached to a sub-shape. In such a case, the sub-shape (and its own sub-shapes) takes its own Color as a priority. Layers are handled using the same principles as Colors. In all operations described below you can simply replace Color with Layer when dealing with Layers. Layers are supported by the class XCAFDoc_LayerTool. STEP identifies a Layer (not by a Number, but by a String), to be more general. Colors and Shapes are related to by Tree Nodes. These definitions are common to various exchange formats, at least for STEP and IGES. This call can be used at any time. The first time it is used, a relevant structure is added to the document. This definition is used for all the following color calls and will not be repeated for these. define a new Property Color, add it to the list of Colors, and then set it to various shapes. When the Color is added by its value Quantity_Color, it is added only if it has not yet been recorded (same RGB values) in the Document. Note that this Color can then be named, allowing later retrieval by its Name instead of its Value. In this example, aLabel can be replaced by aShape directly. Various queries can be performed on colors. However, only specific queries are included in this section, not general queries using names. // yes, there is one ..
// sorry, no color ..
Color name can also be queried from col.StringName or col.Name. In this example, aLabel can be replaced by aShape directly. // col receives the color n0 i ..
XDE can read and write GD&T assigned to shapes or their subparts (down to the level of faces and edges) to and from STEP formats. XCAFDoc_Datum - for geometric tolerance Datums. A GD&T type is identified by the attributes listed above, i.e. XCAFDoc_DimTolTool methods working with particular entity types check for presence of the corresponding attributes in passed labels. One can use methods of XCAFDoc_DimTolTool beginning with 'Is' for this purpose. XCAFDimTolObject_DatumObject - for geometric tolerance Datums. GD&Ts and Shapes are related by Graph Nodes. These definitions are common to various exchange formats, at least for STEP. This call can be used at any time. When it is used for the first time, a relevant structure is added to the document. This definition is used for all later GD&T calls and is not repeated for them. AddDatum - for a new geometric tolerance datum. All methods create a sub-label for the corresponding GD&T entity of the tool master label and attach an attribute specific for the created entity. A similar approach can be used for other GD&T types. A newly added GD&T entity is empty. To set its data a corresponding access object should be used as it is demonstrated below, where the dimension becomes a linear distance between two points. SetDatum - for geometric tolerance datums. These methods can take a single label or a sequence of labels. All previous links will be removed. In addition, a special method SetDatumToGeomTol should be used to link a datum with a geometric tolerance. XCAFDimTolObjects_Tool class provides basic capabilities for searching GD&Ts linked to shapes. 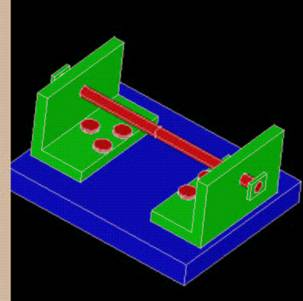 The tool provides sequences of dimensions, geometric tolerances and datums linked with a shape. A series of related datums is also returned for geometric tolerances. 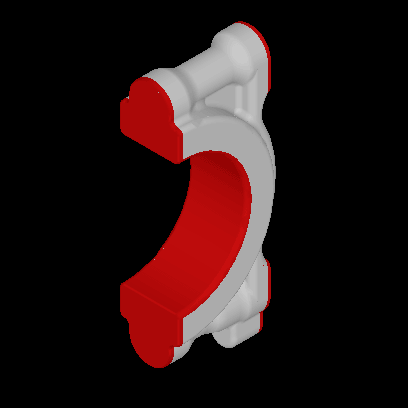 To get reference shapes for a GD&T entity one can use GetRefShapeLabel from XCAFDoc_DimTolTool. XCAFDoc_DimTolTool provides methods to get lists of all dimensions, geometric tolerances and datums. 1 - 19 - for datums. Custom data can be stored in labels with tags beyond the ranges listed above. In an XDE document, Clipping planes are managed by the class XCAFDoc_ClippingPlaneTool. It works basing on the same principles as ShapeTool works with Shapes. This tool can be provided on the Main Label or on any sub-label. Clipping planes are stored in a child of the starting document label 0.1.8, where planes themselves are defined as TDataXtd_Plane attribute. TDataStd_Name attribute is used for naming. This call can be used at any time. When it is used for the first time, a relevant structure is added to the document. The plane will not be removed if it is referenced in at least one view. In an XDE document, Views are managed by the class XCAFDoc_ViewTool. It works basing on the same principles as ShapeTool works with Shapes. This tool can be provided on the Main Label or on any sub-label. Views are stored in a child of the starting document label 0.1.7, where a view itself is defined as XCAFDoc_View sub-class of TDF_Attribute. Views and selected shapes, clipping planes, GD&Ts and notes are related by Graph Nodes. To set shapes, clipping planes, GD&Ts and notes selected for the view use one of overloaded SetView methods of XCAFDoc_ViewTool. To set only clipping planes one should use SetClippingPlanes method. To remove a view use RemoveView method. GetRefAnnotationLabel - returns a sequence of associated annotated labels. GetViewLabelsForAnnotation - returns a sequence of view labels associated with an annotated label. In an XDE document, custom notes are managed by the class XCAFDoc_NotesTool. It works basing on the same principles as ShapeTool works with Shapes. This tool can be provided on the Main Label or on any sub-label. The Property itself is defined as sub-class of XCAFDoc_Note abstract class, which is a sub-class of TDF_Attribute one. Custom notes are stored in a child of the XCAFDoc_NotesTool label, at label 0.1.9.1. Each note then corresponds to a dedicated label. A note may be attached to a document item identified by a label, a sub-shape identified by integer index or an attribute identified by GUID. Annotations are stored in a child of the XCAFDoc_NotesTool label, at label 0.1.9.2. Notes binding is done through XCAFDoc_GraphNode attribute. This call can be used at any time. The first time it is used, a relevant structure is added to the document. This definition is used for all later notes calls and will not be repeated for them. CreateBinData : creates a note with arbitrary binary data, e.g. contents of a file. Both methods return an instance of XCAFDoc_Note class. This code adds a child label to label 0.1.9.1 with XCAFDoc_NoteComment attribute. An instance of XCAFDoc_Note class can be used for note editing. One may change common note data. AddNoteToSubshape : binds a note to a sub-shape. All methods return a pointer to XCAFDoc_AssemblyItemRef attribute identifying the annotated item. This code adds three child labels with XCAFDoc_AssemblyItemRef attribute to label 0.1.9.2. 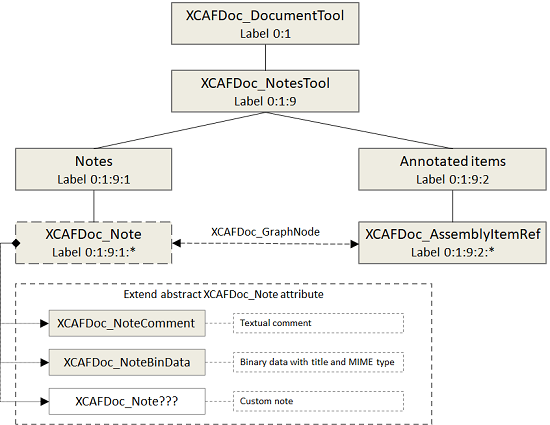 XCAFDoc_GraphNode attributes are added to the child labels and note labels. FindAnnotatedItemSubshape : returns an annotation label for a sub-shape. Null label will be returned if there is no corresponding annotation. GetAttrSubshape : outputs a sequence of note labels bound to a sub-shape. All these methods return the number of notes. RemoveSubshapeNote : unbinds a note from a sub-shape. A note will not be deleted automatically. Counterpart methods to remove all notes are available, too. DeleteOrphanNotes : deletes notes not bound to Document items. All these methods except for the last one break all links with Document items as well. Note that saving and restoring the document itself are standard OCAF operations. As the various previously described definitions enter into this frame, they will not be explained any further. The same can be said for Viewing: presentations can be defined from Shapes and Colors. Previously defined Readers and Writers for dealing with Shapes only, whether Standard or Advanced, remain unchanged in their form and in their dependencies. In addition, functions other than mapping are also unchanged. XDE provides mapping with data other than Shapes. Names, Colors, Layers, GD&T, Clipping planes, Views, Validation Properties (Centroid, Volume, Area), and Assembly Structure are hierarchic with rigid motion. Currently, Clipping planes and Views writing supported for XBF format only. XDE mapping is relevant for use within the Advanced level of Data Exchanges, rather than Standard ones, because a higher level of information is better suited to a higher quality of shapes. In addition, this allows to avoid the multiplicity of combinations between various options. Note that this choice is not one of architecture but of practical usage and packaging. Reader and Writer classes for XDE are generally used like those for Shapes. However, their use is adapted to manage a Document rather than a Shape. The packages to manage this are IGESCAFControl for IGES, and STEPCAFControl for STEP. In addition, the reader provides methods that are applicable to document transfers and for directly querying of the data produced. Use the same procedure as for a STEP file but with IGESCAFControl instead of STEPCAFControl. Get the data relevant for the application by mapping XDE/Appli, then discard the XDE data once it has been used. Create a reference from the Application Document to the XDE Document, to have its data available as external data. Embed XDE data inside the Application Document (see the following section for details). Directly exploit XDE data such as when using file checkers. To have XCAF data elsewhere than under label 0.1, you use the DocLabel of XDE. The method DocLabel from XCAFDoc_DocumentTool determines the relevant Label for XCAF. However, note that the default is 0.1. In addition, as XDE data is defined and managed in a modular way, you can consider exclusively Assembly Structure, only Colors, and so on. This data structure is fitted for data exchange, rather than for use by the final application. The provided definitions are general, for common use and therefore do not bring strongly specific semantics. As a result, if an application works on Assemblies, on Colors or Layers, on Validation Properties (as defined in STEP), it can rely on all or a part of the XDE definitions, and include them in its own data structure. In addition, if an application has a data structure far from these notions, it can get data (such as Colors and Names on Shapes) according to its needs, but without having to consider the whole.